If you don't see the submissions in your email inbox, check your Spam or Junk Mail folders in case the messages are being routed there. If you see the messages in your spam folder, mark them as "Not Spam" using whatever option your email provider gives you. The more of these you mark as "Not Spam" the less likely they'll be to show up in your spam folder. If you don't see them there, make sure you have the correct address assigned to your form. 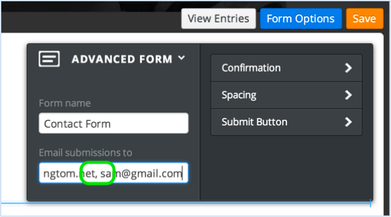 To do so, click on the Form Options button connected to the form in the editor (you'll need to click the form to bring this up). Then make sure the email is entered correctly in the submissions "to:" field. If it isn't, re-enter it and Publish the change to your site. You can even enter multiple addresses if you want. Just separate each address with a comma. 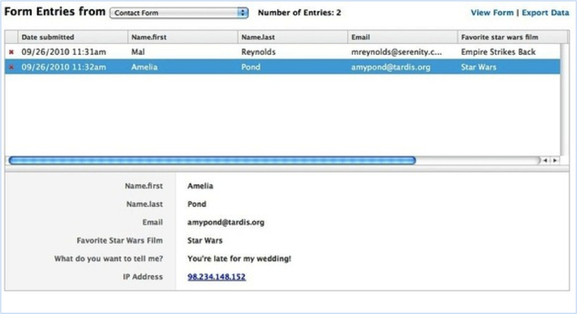 Read more about Editing the Contact Form Address. Delivering form emails to the inbox can be tricky and there are some situations where the emails may be completely blocked. If you cannot find the messages in your Inbox or your Spam folders and you believe the messages really aren't coming through, the best bet is to switch to another address completely (preferably at a provider like Gmail, Yahoo or Hotmail). We're constantly fighting to keep our contact form email delivery high, but we can't guarantee the form messages will be delivered to every address. That just isn't possible. This will bring up all the messages that have been sent to you through any of the forms on this site. You can even export all these messages to a spreadsheet using the Export Data link.